From left: Taylor Rees, Austin Wiley and Darren Boyd and launched Spangalang Brewery last week. Photos by Burl Rolett. Former Great Divide brewers Austin Wiley, Darren Boyd and Taylor Rees opened jazz-themed Spangalang Brewery last week in Five Points. The idea has been brewing for about a year, Boyd said, and started to gel once Spangalang’s bit of Welton Street real estate hit the market in 2014. 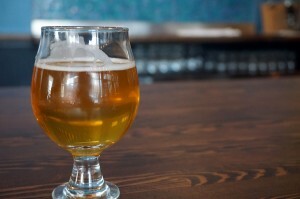 Spangalang launched with eight beers on tap, including two IPAs, a stout and a saison. 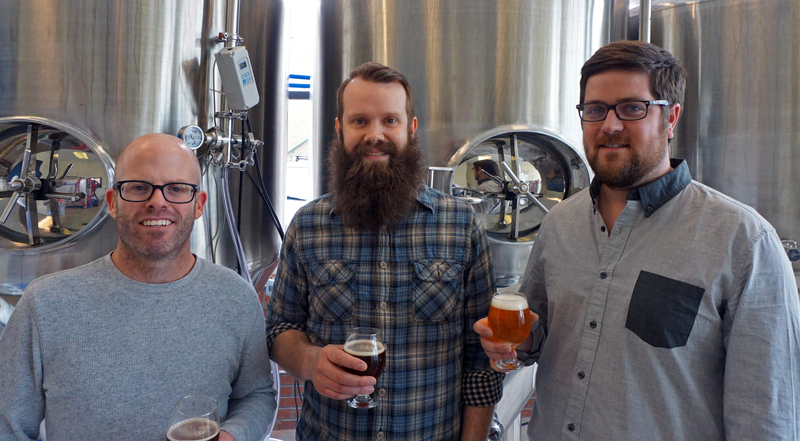 Wiley, Boyd and Rees first crossed paths working at Great Divide Brewing Co. Boyd left Great Divide for a job at Denver Beer Co. about a year ago. About that time, Boyd said, the two began talking about opening their own brewery. Rees, then head brewer at Great Divide, jumped over to Spangalang a few months later. Spangalang signed its lease at 2736 Welton St. in August. The company has about 4,700 square feet, Boyd said, and the taproom and brewery take up about 3,700. Boyd declined to say precisely how much it cost to open Spangalang, but said it was less than $500,000. The three co-owners hold equal stakes in the company, Boyd said, and Spangalang is launching with help from outside investors. Spangalang has a 10-barrel brewing system Boyd said could put out about 1,500 barrels of beer per year if Spangalang brewed every day. The company is aiming to do between 500 and 600 barrels for year one. The Spangalang name is a nod to Five Points’ history as a jazz hot spot. The term refers to a cymbal beat popularized by drummer Kenny Clarke in the 1940s. In keeping with the jazz beat, Spangalang Brewery’s walls are adorned with framed album covers from classic jazz musicians. Spangalang opened its doors on Thursday. The brew house fills out Five Points Plaza, a redeveloped strip center at a former Department of Motor Vehicles location. Five Points Plaza is now 100 percent leased. Other tenants include Flex Yoga and Barre and Fat Jacks Supersubs. Shane Martin from Arrow B Architecture designed the brewery. Spectrum General Contractors was behind the construction. Unlike some other startup Denver breweries, Boyd said Spangalang does not have any plans to sell its suds outside of Five Points Plaza, either in bottles and cans or on draft at other bars and restaurants. Boyd said a brewery needs to sell a ton of beer to make up for the money it pours into bottling or canning gear. There are other costs, he added, like paying a designer to come up with logos. Boyd said the current brewing system at Spangalang can make more beer than they would likely ever be able to sell at their Five Points brew house. 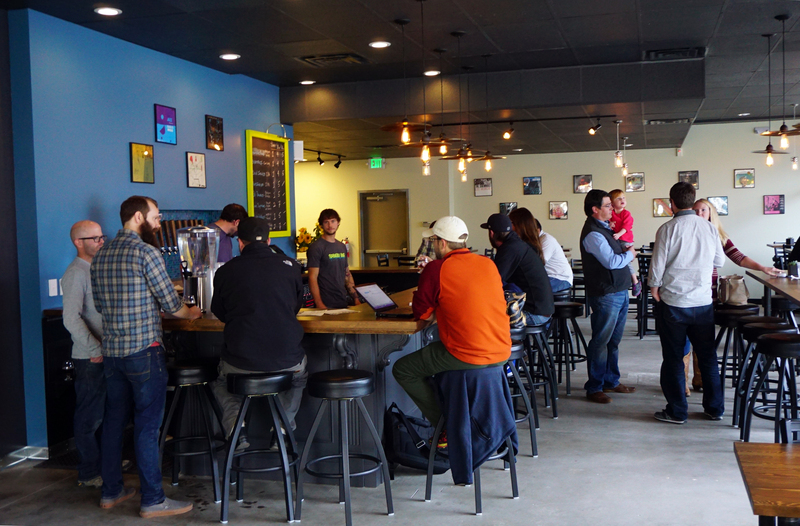 If demand eventually outpaced the Spangalang taproom, the company will look at a second bar before trying to distribute elsewhere. “If this was amazingly successful, we would open another brewery somewhere else and do this same thing again,” Boyd said.